The road to Melbourne is spectacular no matter the direction from which the city is approached. There is a route through the rugged Australian Alps; as well as a Princes Highway seaside route from Sydney that passes beautiful sandy beaches. The Hume Highway is lined with vineyards and fine wineries; and the drive from Adelaide along the Great Ocean Road provides a showcase for some of Australia’s most dramatic scenery. Melbourne (pronounced Mel bun) is located on the banks of the Yarra River is the capital of the state of Victoria in southeastern Australia. The city overlooks the huge expanse of Port Phillip Bay, a sailing and boating paradise. Its beautiful beaches provide recreation for local residents and visitors throughout the year. The many parks along the banks of the Yarra and the Maribyrnong Rivers are popular spots for picnics, parties and barbecues by the water. Magnificent landscaped gardens and parklands make Melbourne one of the greenest cities in the world. The streets of the city center are alive with thousands of residents bustling in and out of buildings that are a blend of grand Victorian and modern architecture and house everything from outstanding galleries to opulent theatres. Hundreds of designer fashion boutiques, many shops and countless rows of sophisticated little cafés line the main thoroughfares. Over 3000 restaurants present fine cuisine accompanied by superb local wines. This friendly multicultural city is home to people from over 140 nations, a fact that is reflected in the excellence and diversity of the food choices that are available. There is something to please everyone. Green and gold trams circle the city providing efficient transportation in the gracious style of days gone by. Children will love the riverboat cruises, water taxis, and gondola rides that provide the best in aquatic travel on the Yarra River. They will also enjoy a visit to a shark at Melbourne Aquarium and an afternoon at the Melbourne zoo. It’s only a short ferry boat ride across Port Phillip Bay to Williamstown and St Kilda, the beach suburbs that function as the playgrounds of Melbourne. This cosmopolitan and sophisticated city hosts major cultural festivals, world famous horse races, smash hit musicals and international sporting events throughout the year. In fact, Melbourne is known as the sporting capital of Australia. Melbourne Festival, Melbourne International Flower and Garden Show, Qantas Australian Grand Prix, Australian Football League finals series, Spring Racing Carnival, Australian Open, Melbourne Comedy Festival and Melbourne Food and Wine Festival are just a few of the key events. Melbourne is the gateway to the State of Victoria. Victoria’s walking and riding trails provide the perfect getaway for anyone who enjoys the beauty of the out of doors. They cover diverse landscapes ranging from National Park wilderness to immaculate gardens, from serene lakes to endless beaches, from rolling mountain ranges to deserts. 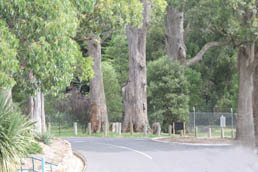 Many hiking trails can be found close to Melbourne within easy driving distance of the city. Many other major attractions are outside the city limits. Nature lovers visit the penguin parade at Phillip Island, the open-range Werribee Zoo and the popular Healesville Sanctuary. Food lovers gravitate to Yarra Valley wineries to sip on pinot noir and dine at the region’s many restaurants. Hundreds of picturesque mountains, lakes and valleys lie within an hour’s drive of the city. Scientists believe that Australia is a piece of continental crust that broke away from Antarctica about 50 million years ago. The result is that many reminders of Australia’s Antarctic heritage remain, and have over the centuries provided challenges to those who immigrated and sought to remake Australia in the image of their native lands. In the 1800’s attempts were made to make the country look more like Europe. Salmon, sparrows, and trout were among the species introduced. All of them competed with native animals and forced their counterparts into extinction. Since the 1980’s there has been a massive team effort by environmentalists and farmers to reverse the extensive damage and to restore the land to its original beauty. Their efforts have paid off. Instead of trying to mould Australia to fit modern European farming methods, agriculturists have learned to work in harmony with the naturally occurring dust storms and floods. The earliest settlers, the Aboriginal people known as the Kooris, adapted to the ebb and flow of Australia’s seasons over 60,000 years ago, and continue to do so today. Sweeping efforts at modernization in Melbourne have occurred in the past 20 years. Highlights include Southgate, a world class casino; the new Museum of Victoria, and the Tennis Center. Major national events such as the Australian Grand Prix have been attracted to Melbourne, and renovation and restoration of the city’s buildings is continuing. High rise buildings have replaced the formerly low rise skyline, though the central area remains intact with its distinctive 19th century architecture including Gothic-style churches, neoclassical public buildings, and terraced houses decorated with cast iron. A result of this rejuvenation of Melbourne has been that residents have wanted to be in the midst of it. Many have left the suburbs and moved into the city itself. The waterfront has been transformed as has the older inner city into new and attractive residential areas. Through it all, Melbourne remains affordable, welcoming, and the place to relax and be yourself while exploring one of the great cities of the world. International Dialing Code: All numbers for Melbourne and the outskirts of the city begin with 03 and have 8 additional digits. The country code is 61. Emergency: Police, fire or ambulance emergencies: 000. General police: 11444; fire: 11411; ambulance: 11440. Currency: Australia’s currency is in dollars and cents. Major credit cards and traveler’s checks are accepted almost everywhere. The easiest method of securing cash at the best exchange rate is to make withdrawals using a US credit card from the ATM machines found at the major banks. Note: Australian seasons are the opposite of those in the U.S.
Sunscreen: Australian sun has strong ultraviolet rays, especially between 11am and 4pm. A wide brimmed hat and high SP sunscreen are essential in Melbourne in the summer when the sun is especially intense. Electricity: ( 240 volt, 50 cycles A/C). Most hotels have 110V shaver outlets. American appliances will need a three pin flat plug adapter and will require a transformer if they do not have a dual voltage capability. Visas and Passports: All visitors require a visa and passport to enter the country. Visas are free from Australian consulates and allow up to a three month stay. There is a charge for business visas. How to get around: Melbourne’s tram and light rail network is the fourth largest in the world. There are 135 miles of double track carrying trains through the city and out into the suburbs. Fares are paid through pre-purchased tickets or travel cards. Services run regularly from five in the morning until midnight. Many train services link to bus and tram routes so you can negotiate your way to most places in Melbourne within a short walk from a train, tram or bus. You will also find taxi stands outside many train stations. Spencer Street Station is the main city station from which you can take trains to other parts of Victoria. Most stations on the loop provide services to outer suburbs or trains that link to a connecting train to take you on to your destination. The City Circle tram provides a free and convenient way to visit the shops, museums, etc. in the City. Its route includes shopping malls, arcades, and many of the major attractions. Trams run in both directions every 10 minutes from 10am-6pm (except Christmas Day and Good Friday). Hours are extended to 9pm when daylight saving time is in effect. Taxis can be hailed from the street or from one of the stands around the city. Look for the yellow taxis swarming major hotels and train stations. Flinders Street and Spencer Street Stations and Lonsdale Street outside Myer are the best places to hail a ride. All taxis are regulated and charge the same amount per kilometer. If you wish to book there is a small fee and several companies from which to choose. Taxis for the disabled are also available. Air Travel: Melbourne Tullamarine Airport is about 20 minutes from the city. If traveling at peak times, add another 30 minutes. The most direct route to the Airport is via Tullamarine Freeway, which is part of City Link. Part of this trip takes in the City Link road network and state-of-the-art electronic tolling system. There are no tollbooths to slow down the flow of traffic but a day pass must be purchased before using the network or by 12:00 noon on the following day. This fee is computed as part of the fare when using a taxi or airport bus. Rental car companies have other arrangements and customers will be informed of these at the time of car pickup. Day passes can be purchased at the customer service center at the airport, via the direct dial phones provided, or from a City Link service centre located adjacent to the freeway. To purchase day passes and for other information you can contact City Link at 03 13 26 29. Sky Bus offers services from Spencer Street, Franklin Street and the Town Hall and departs about every half an hour. Driving a car in the Melbourne area: Australians drive on the left hand side of the road. There are one way streets, two directional carriage ways and some multiple lane carriage ways, often divided by a median strip. Take care when turning onto these multiple lane roads. All lanes may be travelling one way. Outback regions are linked with dusty narrow roads which require careful negotiation. There is a great similarity to driving on icy roads. Another hazard in the country is the possibility of a kangaroo, wombat or koala crossing in front of the car. Drivers are required to carry a license at all times. An overseas license is acceptable as long as it is in English. Cycling: Cycling country roads is fine way to spend a day. Riders are likely to encounter very few hills and only gentle inclines. Helmets are required by law. For an all-inclusive price, card-holders get cashless entry to almost 60 leading attractions, including Melbourne Museum, Melbourne Aquarium, Victoria’s Open Range Zoo, Penguin Parade and Puffing Billy Steam Railway. Walk through a living forest gallery, discover the tumultuous history of Melbourne and experience Aboriginal cultural performances in this ultra-modern, hands-on museum. Performances, activities and interactive displays make a visit to the Melbourne Museum a truly memorable experience. The National Gallery of Victoria (NGV) has an impressive range of international and Australian art housed within its recently renovated walls. Most of the Australian art is now located at the NGV’s Ian Potter Centre located at Federation Square. This new building and the renovation of the original gallery on St Kilda Road provides exhibition space for literally thousands of previously unseen treasures. With a reputation for excellence, versatility and innovation developed over almost 100 years the Melbourne Symphony Orchestra is renowned for its performances of the great symphonic masterworks with leading international soloists and for its appearances with The Three Tenors, Frank Sinatra, Kiri Te Kanawa, Elton John, John Farnham, supergroup KISS, Dionne Warwick, Meat Loaf, tenor Andrea Bocelli, Harry Connick Jr and kd lang. Tours depart Monday to Saturday at midday and 2.30pm. Crowned by a magnificent spire, one of Melbourne’s most distinctive landmarks, the Arts Centre is the city’s hub of visual and performing arts. Explore the centre’s many theatres and discover the history of the site on a guided tour. Tickets are available from the concierge located near the entrance. This is a museum that most families will enjoy, where parents don’t have to worry about their children breaking something. The museum features a large number of interactive activities for children and adults alike. There are displays that will interest those that are not surfers, as well as surf fanatics. For surfing enthusiasts, the museum offers tips on some of the best surf locations in Victoria. Daily 10-5 Children under 18 months free. Historic building houses toys from the 1880’s to the present. A special feature is a permanent display of dolls and doll houses. There is also a garden with a miniature steam train and the Magic Pudding Café which caters to the tastes of children. One of the largest indoor amusement centers in Melbourne, Fun Factory is equipped with Daytona racing machines, pinball, shooting and skill test games, pool tables, a rollerblade rink and “dodge-em” cars. This combination sporting facility and playground has a wave and toddlers’ pool, a water slide, pool garden, and a diving complex. Childcare is available Mon.-Fri. 9-Noon. A school holiday program and one on Saturday mornings for children ages 5-12 are low in cost, and high in educational and entertainment value. This historic steam train still runs regularly in the mountain district it was built to serve at the turn of the century. Puffing Billy, Victoria’s best known steam train. travels through the beautiful bush land of the Dandenong ranges. The Railway is the sole survivor of four experimental lines used to develop rural areas in the early 1900’s. Puffing Billy is now a major tourist attraction, its operation depending on hundreds of dedicated volunteers. 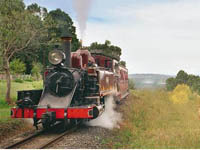 Catch Puffing Billy to Emerald, have a picnic lunch, then travel back to Belgrave. Puffing Billy runs every day of the year, except Christmas day, and is a 24.5 km operating museum. Enjoy the mountain scenery and panoramic views which pass by your carriage window. Lakeside, the intermediate terminus of the railway, is inside beautiful Emerald Lake Park. You may stop over for a few pleasant hours bushwalking, swimming or just relaxing in the peaceful country setting. The terminus of the line at Gembrook is a delightful country town with much to offer the visitor. Go behind the scenes…see prints and paintings, ornate silverware and porcelain trophies, in portrait-lined hallways. A series of interactive exhibits teach participants about science and technology. The subjects range from sports, to insects, to the human mind and body. There is also a digital planetarium. Epping Line from Flinders St. station to Victoria Park station. Children can pet and feed a variety of farm animals (call for exact feeding times). They are also shown how to do simple farm chores and can milk a cow, etc. Farm tours instruct at a child’s level about plants and animals along the way. The first day of each month is Family Day. Horse rides and a home made farm lunch are part of the fun on these special days. 10 – 5 everyday except Christmas Day, Good Friday & during August. For overseas visitors and Australian visitors alike Healesville sanctuary offers a complete relaxing day out. Explore the Sanctuary, set in the lush bush land of Healesville on the Badger creek, home to one of Australia’s most loved, and most secretive animals, the platypus. See a wide variety of Australian Fauna and flora. See emus, kangaroos, echidna’s, koala’s, possums and many other Australian natives, in natural and peaceful settings. Tram 55,56,or 68. Admission charged. You can not visit Melbourne without visiting the Royal Melbourne Zoo! The Royal Melbourne Zoo offers a large range of exotic animals, beautiful gardens and an educational experience to all its visitors young and old. Popular Meet the Keeper sessions (wombats, seals, pelicans, penguins) teach children about the animals in a most engaging manner. There are also twilight tours for better views of nocturnal animals. A whole day is needed to explore and enjoy the Zoo to its full extent. Werribee Line from Flinders Station to Werribee station. You travel around the zoo which has only African animals in a bus, in order to have a better idea of how animals interact with each other in the wild. In addition there is a 30 minute Volcanic Plains walking Trail. A whole day is needed for Sovereign Hill, it is an educational theme park and is suitable for people of all ages and all interests. The gold rush themed park offers many old styled shops selling everything from hot bread and scones to metal goods . Children have great fun panning for gold in the creek, many usually finding some real gold dust! Visitors can go through a tour of a gold mine, and see exhibits and souvenirs of real gold. The museum is set in the first Australian Naval College (from 1913-1919). The museum has a wealth of information and a large and interesting range of exhibits. The museum includes model ships and submarines, and the museum is said to be haunted by a ghost! an interesting day for all those interested in history and ships. you will need about 1 – 2 hours to visit the museum. One of the most popular attractions at Phillip Island, along with the Penguin Parade and Koala Conservation Center is Seal Rocks, the sea life center offers educational and enjoyable insights into the life of the Australian Fur Seal. The Center displays views of Seal Rocks and the Nobbies, which is home to Australia’s largest fur seal colony. There is also a sea gull rockery and a few penguins. Admission to Luna Park is free. Sunday:1pm until dusk. Closed Christmas Day. A day of family fun is Luna Park, offering a large selection of rides including a roller coaster, ferris wheel and ghost train.. Luna Park is Melbourne’s own “mini theme park”. Take a walk with Australian wildlife and have a close encounter with Brolga, Kangaroos, Emus, and waterfowl. Delightful picnic areas are available with barbeques in this wetland setting. Discover the serenity of Serendip Sanctuary. A delightful visit for the whole family, particularly animal lovers. spring time (September – November) is the best time to visit, as there are a lot of cute baby birds. Check for locations and game times. AFL, Aussie Rules, football is the favorite sport, followed by millions. For sheer atmosphere and excitement it’s an experience not to be missed. Situated at Southbank, opposite the Crown Casino on the tranquil Yarra river, it has a large collection of fish and sharks enjoying life in its aquariums and oceanarium. The aquarium towers 2 stories high and goes one story underground, and is even under the Yarra itself! Some of the aquarium attractions include a coral atoll, oceanarium, and billabong display. The Royal Botanic Gardens are situated on the edge of Melbourne next to the Yarra River . Surrounding them is a beautiful lake with ducks, eels and swans. The gardens contain a variety of plants from all over the world. There are many beautiful spots for a picnic lunch by the lake on the lush green lawns. This is a country garden right in the heart of Melbourne! Remember to take a little extra bread as the children enjoy feeding the swans, ducks and eels. Visitors usually bring their own food but there is a snack kiosk on premises. This is a fascinating place for a family day trip, set in the mountains of the Brisbane ranges, southwest of Melbourne. The Fairy park offers playgrounds, walks and attractions for the whole family. An entire day could easily be spent exploring. The park has a medieval castle theme and is truly magical. There is quite a bit of walking involved, and the park is on a hill. Hours change depending on the time of year. the world’s smallest penguins come in just after sunset. Visitors to Phillip Island look forward to the Penguin Parade. The penguins put on an impromptu show just by performing their ordinary daily routines. You do need to wear something very warm in the evening as the cool sea breeze is part of the fun. Large cafeteria style restaurant, snack bars, and extensive gift shop and theater are located in the Visitor Center. Some of the best of Melbourne culture may be experienced by a visit to some of the many markets that the city has to offer. Market Days: Tue & Thurs 6am-2pm, Fri 6am-6pm,Sat 6am-3pm, Sun 9am-4pm. From Elizabeth Street take any tram. Corner of Victoria and Elizabeth Streets Everything from fruit and vegetables, fresh produce and delicatessen goods to clothing, plants and pets are sold at this market which covers seven hectares (around 1000 traders) and is renowned as a gourmet paradise. Its origins date back to 1857 and many of its buildings have been classified by the National Trust. The Magical History Tour of the market explores 125 years of history and allows participants to meet vendors. From Swanston Street take #15 or #16, from Bourke Street #96. Unique handcrafted gifts are made and sold by stall holders along this beachfront esplanade. There are over 200 stalls. Walk from Flinders Street Station across Princes Bridge. Located in the heart of Melbourne’s arts and culture precinct, this market features local artists and craftsmen who sell their own work. Take tram #8 or #72 to Chapel Street, or a train to South Yarra Station.With its fresh produce and wide range of delicatessen goods, this lively market is frequented by locals and visitors alike and is just a short walk from fashionable Chapel Street. Como, with its impressive architecture and extensive garden was the home of the Armytage family for 95 years. It is now possible to explore the life and social history of this family as it was in the 1920s and 1930s and take advantage of the many activities and programs that have been developed to bring to life the history of those times. Mon.- Thurs. 9:30-6:30; Friday: 9:30-8 Sat. & Sun. : 8:30-8. Australia’s largest indoor play center has piles of plastic tubing formed into tunnels, ladders, and just piles of tubing which appeal to all ages of children. Cappuccino, television and free newspapers and magazines are provided for the entertainment of the adults. The Gold Treasury symbolizes the wealth of the gold rush era, and showcases a diverse ongoing program of exhibitions. Built on Gold explores the legacy of Victoria’s gold. 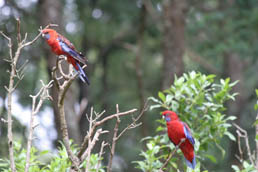 Stroll with kangaroos, meet an emu on the path and encounter colourful birds in a natural bushland setting. An easy drive from Melbourne. Day tours available. Films screen on the hour from 10am-10pm, 7 days a week. The sights are bigger at Imax Melbourne. See the world as you’ve never seen it before, on the world’s biggest screen at the Imax theatre. Embark on a journey of discovery at this Contemporary Museum, where Victorias immigration history is brought to life through voices, images, memories and belongings. Climb aboard the 17 meter ship and explore the sensation of ship travel to Australia over the past 200 years, then relax in the beauty of one of Melbourne’s finest 19th Century buildings, the Old Customs House. Melbourne Aquarium provides an innovative environment where fish are heroes and visitors can achieve the ultimate underwater experience. Walk through clear tubes, surrounded by 7 metres of water, watch great sharks, stingrays and other aquatic life. A total immersion experience from the moment visitors meet their electronic host fish and disappear into the exhibit zones, until they exit experiencing the excitement of state-of-the-art simulator rides. No visit to Melbourne would be complete without an award-winning trip on the Yarra with fantastic views and informative commentary in the comfort of a Melbourne River Cruiser. Choose from the Scenic River Gardens up river cruise, the Port and Docklands down river cruise, or for the complete city experience, the Melbourne Highlights up and down river cruise. All vessels are fully enclosed with on board amenities and snack bar. A visit to the internationally acclaimed Melbourne Zoo is a fantastic experience. Wander through an African Rainforest where gorillas bask in the sun, mandrills forage on the forest floor and pygmy hippopotamus drift through the river. Observe otters playing in the rapids or enter the steamy brilliance of the Butterfly House. View Australian animals in the exhibit entitled Australian Bush. Victoria’s oldest surviving penal establishment. Today it houses a fascinating exhibition on the 19th century jail life including the death masks and memorabilia of some of Melbourne’s most notorious criminals. Alternatively, book a Night Performance and explore the gaol by candlelight. The restored iron barque Polly Woodside is afloat as the main exhibit of Melbourne’s extensive Maritime Museum. Build in 1885, she made 16 voyages around Cape Horn before sailing for 20 years in Australasian waters. Come aboard, smell the tar and rope in the forepeak store and listen to her creaking and heaving on her mooring ropes. This world famous steam railway travels through the magnificent Dandenong Ranges from Belgrave, only one hour east of Melbourne, to Emerald Lake Park and Gembrook, every day of the year, except Christmas Day. Together with traditional rail journeys, First Class options available are, Devonshire Tea, Luncheon or Dinner, in luxury fully enclosed dinning carriages. Easily accessible by fast electronic train from Melbourne. . Sample a range of fine Victorian and unique Australian produce as you taste your way around the Market. Discover a world of new tastes and flavours, meet friendly traders and gather hints from professional tour guides. Enjoy the spectacle of a Heritage Tour, a journey over the markets 7 hectares, reliving its 120 years of history. Open from 10am until late, 7 days a week. Spectacular 360-degree panoramic views of Melbourne and surrounds, from the tallest building in the Southern Hemisphere. Facilities include Rialto Vision the award winning sight and sound extravaganza, gift shop, licensed cafe, function room and Zoom City live action cameras. Rippon Lea is the last of Australia’s great privately owned 19th century suburban estates. The Victorian Pleasure garden, of international significance, includes a lake, island and bridges as well as a large Victorian Fernery. The mansion retains much of the Victorian splendour of the Sargood family but also reflects the 1930s Hollywood style of its last owner, Mrs. Louisa Jones. Open from 7.30am, 7 days a week. Discover one of the great gardens of the world, only minutes from Melbourne’s heart. Stroll through landscapes displaying plants from across the globe, join a guided walk or take a self-guided audio tour. Exclusive gift shop and cafes in magnificent setting. This historical cottage that Captain Cook purportedly once lived in was transported to its present site from Yorkshire in 1934. The cottage is located in the beautiful Fitzroy Gardens close to the city center and the MCG, you can get to the cottage via the free City Circle tram, which stops a short walking distance from the cottage. The cottage is a place to visit for those interested in Melbourne and Australia’s History, though it may not interest small children. Scienceworks is Melbourne’s award winning hands-on science and technology museum. Encompassing the Melbourne Planetarium, Scienceworks features changing exhibitions, historic objects, live shows, tours and events. Safari Tours depart from 10.30am. Last tour at 3:40pm. Experience a unique wildlife safari. Enjoy close up views of grassland animals from Africa, Australia and Asia. Rhinos range free with giraffe, zebra and antelopes, while hippos wallow in waterholes and kangaroos graze nearby. Facilities include guided safari, walking trails, discovery centre, Meerkat Bistro & Function Centre and Safari Shop. World Golf Championships are a series of events launched in 1999 that feature the game’s top players competing against each other in a variety of competition formats. The Australian Open features many of the biggest names in tennis and an off-court carnival. Victoria’s Gay and Lesbian, Bisexual, Transgender and allied communities hold their annual pride march in St Kilda. Up to 40,000 people, including 120 organisations, march to express their pride and solidarity. Family and friends are encouraged to attend. The principal sponsor is the City of Port Phillip. One of Australia’s leading golf tournaments, featuring the best Australian players and international stars. An annual celebration of fashion and style, offering a wide range of parades, performances, business events, exhibitions, international guests and gala events. The Australian International Airshow is the largest and most comprehensive aviation event in Australia, featuring a very impressive list of world class aviation, defence and aerospace companies. This show is staged every two years by Airshows Downunder. Experience the best in thoroughbred racing at the home of some of the most exciting horse racing in the State. The Maroondah Festival is one of the largest free community festivals in Melbourne and presents an exciting program of entertaining activities. The activities include stages full of entertainment including a performance from a renowned band, craft markets, youth and children’s area, amusement rides, informative business displays, street theatre and plenty more for the entire family. See the champion horses of today and tomorrow racing at one of Australia’s premier racecourses. Free jazz concert in the picturesque Canterbury Gardens with children’s entertainment provided. Bring along a picnic and a rug and enjoy some of the gourmet food and refreshments available for sale. Set on Albert Park’s street circuit, this race is one of the longest on the Formula One World Championship calendar with a track length of 5.26kms. The race is the first of the racing calendar and is set around a four day carnival of motor sports and public entertainment. Experience the best in thoroughbred racing at the home of some of the most exciting horse racing in the State and witness Victoria’s richest race for two year olds. The success of the Melbourne International Flower and Garden Show is now a matter of record and continues to grow in horticultural and floricultural excellence with displays continuing to enthrall visitors. Held within the historic Royal Exhibition Building and the surrounding Carlton Gardens the event features over 300 exhibitors ranging from floral designers, flower growers, landscape architects and designers, leading nurseries and florists. A family day at the races. Highlights include an Easter Bonnet competition, the Clip Clop Club for children and the running of the Red Tulip Easter Cup. A classic event for three-year-old horses. Commencing in 1971 this is Australia’s main festival of early music with a wide range of performances by local and international soloists, ensembles, orchestras and choirs in some of Melbourne’s most beautiful buildings. The week long program of over 20 events includes concerts, seminars, master classes and an historic tour. Memorial march to the Shrine for those who fought and died for their country. Members of the local community are invited to remember the fallen and since departed comrades who have represented their country during war. The A R Dobson Australian Steeple and the Australian Hurdle are the feature races at this meeting and have long been regarded as two of the most prestigious jumps races on the Australian racing calendar. Established in 1952, the Melbourne International Film Festival is a showcase for the latest developments in Australian and international filmmaking, offering audiences a wide range of features and shorts, encompassing fiction, documentaries, animation and experimental films with a program of more than 290 films from 40 countries. Melbourne University’s Student Arts festival comprising drama, dance, visual arts and music. Held every two years. The AFL Grand Final is the superbowl of Aussie Rules. Attracting more than 95,000 fans to the MCG, it brings the nation to a standstill as the two best teams fight for the coveted Premiership. There are themed activities including an activity trail, prizes, artifacts table and face painting. Bring dad along to the zoo for special Father’s Day Safari Tours and a free card making activity. Bring the family along to enjoy a day’s horse racing with one of the most important feature races on the horse-racing calendar at one of the best racecourses in the Metropolitan area. The Hygain weekend is one of the largest championship showjumping events on the Australian calendar, with the best horses and riders from around the country competing for titles. Introduce your family to the magic of the Melbourne Symphony in a concert for the family. One of the series of ten concerts that explore the great orchestral tradition. Some of the finest conductors and soloists from around the world will perform with the Orchestra to bring you the excitement, passion, drama and enchantment of the great masterworks of the classical repertoire. The Biggest Event in the Event State brings the magic of the country to the city for 11 days of animals and events, produce, art and crafts, machinery and equipment, food, fun and sideshows, rides and much, much more. All this can be found just 15 minutes from the city centre. Refreshing music and morning tea are the successful ingredients of these hour-long morning concerts. The Melbourne Fringe Festival is Melbourne’s annual open access three week program of innovative and experimental art across all art forms. A showcase of new work and new ways of presenting, in hundreds of individual events, across the city. One of the major events on the Victorian golfing program. October is Zoo Month so come along and join in the special activities run every weekend throughout the month. Visitors are invited to participate in the many activities that will explore the many floras, as well as endangered species of grasslands, around the world. Australia’s oldest marathon incorporates the Melbourne Marathon (42km), the Melbourne Half Marathon (21km), the Melbourne Marathon Relay (42km), the Melbourne Marathon Bike Ride, a 6km Fun Run/Walk and an in line skate event. The Melbourne Champions is one round of the 21 tournament world circuit for former champions aged 35 and over. The tour features players of the calibre of Jimmy Connors, John McEnroe, Bjorn Borg, Guillermo Vilas, Yannick Noah, Johan Kriek, Henri Leconte and John Fitzgerald. The Melbourne Festival is among the world’s premier arts festivals, renowned for presenting the cream of Australian and international events encompassing all art forms. This festival is a 17-day cultural feast featuring hundreds of music, opera, dance, theatre and artistic performances in a host of venues, both indoors and on the streets of Melbourne. A time of feasting and fun for the whole family. Visitors are treated to German, Austrian and Swiss style food and beverages, music and continuous entertainment in new large festival halls and the main stage area. The North and West Melbourne Multicultural Arts Festival features music, performance and food reflecting the cultural diversity of the area. Errol Street explodes in colour, music, dance and fun. Over 100 stalls, 30 acts, exhibitions and thousands of people; this festival celebrates the rich cultural life of North Melbourne. Reclaim the Night is organized by a collective of women working together to show that violence against women and children will not be tolerated. The celebration and march acts as a symbol of women’s right to go about their community in safety. The celebration is on the same night throughout Australia and the world. An annual event featuring top players from Australia, South America and Europe competing in the fast and furious action of International Polo. Wine tastings and picnic hampers in historic Werribee Park. Presenting the inaugural Arabian Horse Futurity Show. See Australia’s best 2 year old Arabians competing for the Futurity Championship. All horses will be eligible to race in the Futurity Race for 3 year olds. Indulge in the beauty and fragrance of roses. See them blooming on a rose farm, in beautiful gardens, in hot houses and in trial beds. Lectures will be running daily at Tesselaars and Roses Galore. Over 50 rural producers from all over Victoria selling their handmade crafts and produce in the three weeks leading up to Christmas. Handcrafted gifts include ceramics and pottery, sheepskin and emu products, gourmet foods, Aboriginal artwork, children’s toys and clothing, glassware and timber gifts. Arguably the greatest oratorio ever written, Handel’s masterpiece, Messiah, is filled with a seemingly inexhaustible supply of glorious melodies. Join us in this annual joyous celebration of music that will literally bring you to your feet. The Saturday performance of this work is included as part of the Choral Series. This classic track cycling race was first run in 1947. See Australia’s Olympic and world champion cyclists in action. Millions of families each year enjoy the original Carols by Candlelight at Melbourne’s Sidney Myer Music Bowl. The cream of Australian talent perform at the event, a major fundraiser for the RVIB, which assist children and adults who are blind or vision impaired. Experience a unique wildlife Christmas through the grasslands of Africa, Asia and Australia. The Melbourne Boxing Day Test Match is one of the great traditions of sport in Victoria and Australia. More than 160,000 passionate cricket fans attend the historic Melbourne Cricket Ground to support Australia in the biggest Test Match in the world. – Visit our home page for all travel deals such as:cheap airline tickets, hotel rates, car rental, vacation packages and tourist attractions. Why pay more? save your money now!